You can use the Data property of an Exception object to store some additional data that is meant to help the caller to better understand the context in which the exception occurred. The Data property refers to a dictionary of keyword/value pairs. You can add your own keyword/value pairs after you create the Exception object and before you throw the exception. Both the key and the value can be any object, but you’ll most often use a string as the keyword. In the code below, we use the Data property to pass some relevant data back to the caller. It was a helpful post. However, I just want to confirm, what version of Visual Studio is this supported? 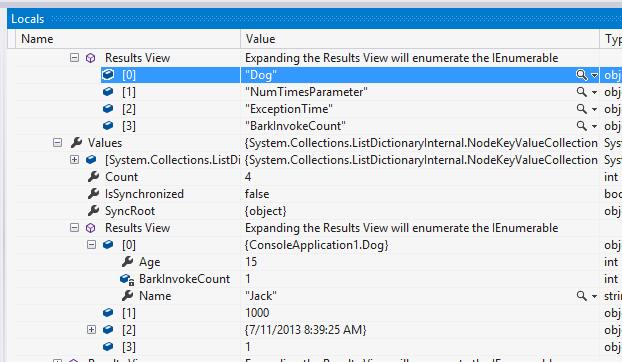 The Exception.Data property isn’t related to Visual Studio. The property showed up in .NET Framework 2.0, so any version of the Framework since 2.0 will have it.